Some people joke that when they see a spider in the house, it’s time to take care of it with a gallon of gasoline and a match. We understand the humor in this, but once you know a bit more about spiders, you’ll know that only some spiders deserve this heebie-jeebie response, while others can be safely scooped up in a cup and taken outside, yet others can be left to do their job inside the house. 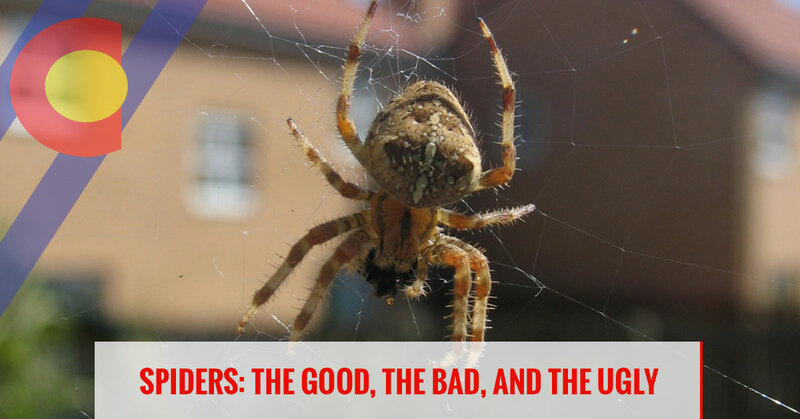 In this week’s blog, we’ll go over some common Colorado spiders and insects and review what you can do with them if you find them in your house. If your house has become the Tokyo of spiders as spring weather arrives, call us at Colorado Pest Management and we’ll come out, make a custom plan, and carry that plan out—all without gasoline and match—so you can reclaim your home. We use integrated pest management, which is effective and eco-friendly pest control. For a critter to be considered a proper spider (we’ll talk about the non-spider riff raff in a moment) there are a few characteristics they have to have. One is a segmented body, including a section that is a fused head and thorax and an abdomen. They are distinguished from arachnids by a lack of antennae, and they also have fangs and inject venom. Insects, by contrast, have three sections: a head, thorax and abdomen, six legs, and compound eyes. The Brown Recluse spider, also known as the Fiddleback spider, is a light brown spider with a dark brown mark on its thorax that is the shape of a violin. Including their legs, they are about the size of a nickel, but their body is small compared to their legs. Their venom is dangerous, being of the necrotic variety. This means that the venom kills tissue around the location of the bite. They are, as their name tells us, reclusive, preferring dark closets, woodpiles, and even dressers and bed sheets. If you find one of these, safely kill it. If you find several, call us. Black Widow spiders are native to Colorado and are found in dark spots that are not generally disturbed, such as wood sheds and unused sheds. The females are black and easily spotted when they hang upside down and are distinguished by a red mark on their undersides. The shape of the red spot varies from species to species. The females are the ones to watch out for because their venom is dangerous to humans. Though rarely fatal to humans, the bites can be very painful. When they bite a family pet, a large vet bill is likely to follow. These spiders get the thumbs up to kill, safely. If you find several, call us for ideas about how to make sure you have no more in your home. There are many types of Jumping spiders and you can recognize members of this largest family of spiders by their large front four legs and their large eyes. It is said that they have the best eyesight of all spiders. They are also hairy. These fuzzy spiders are often found in window sills, where they catch and eat fruit flies, house flies, and other pesky flying insects. These spiders are great to have in your home, so if you don’t mind them, give them a name and let them rid your kitchen or bathroom of insects. If you don’t like them, you can scoop them up and deliver them outside. Call us today if you have any spider population that you don’t want in your home and we’ll use Integrated Pest Management to rid your home of it. Call us today.